At the ManxSPCA we highly recommend microchipping your pet. Our animals all get a microchip before going to their new homes. Microchipping your pet gives them the best chance of being identified and returned to you if they become lost or stolen. Many pets can be microchipped including cats, dogs, rabbits and horses. Check with your vet for advice, as it will depend on the species, size and condition of your animal. Pets are lost without it. Thousands of pets are lost every year and many are never reunited with their owners – microchipping can change that. While collars and tags can get caught or removed – microchipping identifies your pet permanently and effectively. 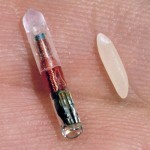 A tiny microchip is inserted under the animal’s skin. This gives the pet their own unique code. The microchip can be scanned and matched to the owner’s contact details, which are kept on a database, such as the national PetLog database. You must make sure the database you are registered with has your up-to-date contact details. The happy tale of Henry – all because of a microchip! 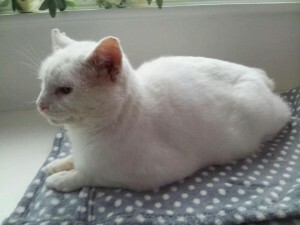 Imagine our surprise and delight when we had a call from Katie in Cattery at the ManxSPCA telling us that she had our cat and that he was ready for us to bring home – we could not believe it. Our Henry had been living rough at the Braaid for all of this time and he had gone from door to door, eventually being fed by one kind person who then brought him to Ard Jerkyll because of a change in circumstances. When Katie scanned him she called the registered mobile number – thank heaven I never changed it! – and we really couldn’t believe that it was our Henry, returned to us after all these years. He knew me straight away and purred his heart out as I brought him home to meet my wife and son, both of whom came into my life after Henry disappeared, and my now grown-up daughters were thrilled to be re-united with him as they doted on Henry when he was a kitten. Henry has settled into our home as if he had always lived there and this story has a happy ending – all because of a small chip inserted into his fur. Without that bit of technology, Henry would never have been brought back to us so please microchip your pet – remember Henry who now has the life he deserves with his loving family. Ard Jerkyll means High Hopes in Manx Gaelic and that is certainly what that tiny ID no bigger than a grain of rice gave to us and Henry. Two messages here…………microchip your pets and, most importantly, never lose hope.